A flagellum (plural, flagella) is a long, whip-like projection or appendage of a cell composed of microtubules (long, slender, protein tubes) and used in motility. They help propel cells and organisms in a whip-like motion. The flagellum of eukaryotes usually moves with an “S” motion and is surrounded by cell membrane. Eukaryote flagella are similar to cilia—another structure that extends out from the surface of cell and is used for movement—in that both are composed of nine pairs of microtubules (nine microtubule doublets) arranged around its circumference and one pair of microtubules (two microtubule siglets) running down the center, the 9 + 2 structure (Towle 1989). However, flagella are longer and typically occur singly or in pairs, or at least much smaller numbers than cilia, which occur in large numbers (Towle 1989). There are also functional differences in terms of type of movement or force exerted. Flagella use a whip-like action to create movement of the whole cell, such as the movement of sperm in the reproductive tract. Cilia primarily use a waving action to move substances across the cell, such as the ciliary esculator found in the respiratory tract. Cilia may also function as sensory organs. Prokaryotes may have one or many flagella for locomotion, but these differ significantly from flagella in eukaryotes. Flagella in archaebacteria are distinct from both of those types. The structural similarity of cilia and eukaryote flagella, and the substantial differences between flagella in eukaryotes and prokaryotes, is such that some authorities group cilia and eukaryote flagella together and consider cilium simply a special type of flagellum—one organized such that many flagella (cilia) may work in synchrony (Patterson 2000). The term undulipodium is used for an intracellular projection of a eukaryote cell with a microtuble array and includes both flagella and cilia. In Protozoa— a diverse group of single-celled, microscopic or near-microscopic protist eukaryotes that commonly show characteristics usually associated with animals—those organisms with flagella (flagellates) are generally placed in the phylum Zoomastigina (or Mastigophora), whereas those with cilia (ciliates) are placed in phylum Ciliophora. Many parasites that affect human health or economy are flagellates (Patterson 2000). These include such parasitic protozoans as members of the genera Trypanosoma (cause of African trypanosomiasis, or sleeping sickness, and Chagas disease, or South American trypanosomiasis), Leishmania (cause of leishmania, which affects millions of people in Africa, Asia, and Latin America), and Giardia (causes giardiasis) (Towle 1989). Trypanosoma species are carried from host to host by bloodsucking invertebrates, such as the tsetse fly and conenose bugs; Leishmania is carried by sand flies; and Giardia is carried by muskrats and beavers (Towle 1989). Protozoan flagellates play important ecological roles in food chains as major consumers of bacteria and other protists and the recycling of nutrients. (Patterson 2000). The flagellum has been a prominent focal point in the debate between those advocating Darwinism and those advocating intelligent design (Miller 2004). Bacterial flagella are entirely outside the cell membrane (plasma membrane) and are normally visible only with the aid of an electron microscope. In some bacterial species, the flagella twine together helically outside the cell body to form a bundle large enough to be visible in a light microscope. These structures are quite unrelated to the flagella of eukaryotes. A eukaryote cell usually only has about one or two flagella. The flagella also may have hair or mastigonemes, scales, connecting membranes, and internal rods. Flagellates move by whipping the flagella on the flagellate side to side. A sperm cell moves by means of a single flagellum. In a multicellular organism, cilia or flagella can also extend out from stationary cells that are held in place as part of a tail goes into a layer of tissue. In eukaryotic cells, flagella are active in movements involving feeding and sensation. Movement of a unicellular organisms by flagella can be relatively swift, whether it be Euglena with its emergent flagellum or a sperm cell with its flagellum. Unlike bacteria, eukaryote flagella have an internal structure comprised of nine doublets of microtubules forming a cylinder around a central pair of microtubules. The peripheral doublets are linked to each other by proteins. These proteins include dynein, a molecular motor that can cause flagella to bend, and propel the cell relative to its environment or propel water or mucus relative to the cell. Bacterial flagella are helical filaments that rotate like screws. 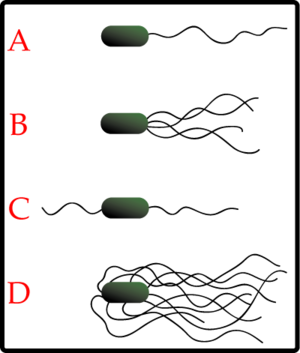 Archaeal (archaebacterial) flagella are superficially similar, but are different in many details and considered non-homologous. Eukaryotic flagella—those of animal, plant, and protist cells— are complex cellular projections that lash back and forth. The bacterial filament is composed of the protein flagellin and is a hollow tube 20 nanometers thick. It is helical, and has a sharp bend just outside the outer membrane called the "hook" which allows the helix to point directly away from the cell. A shaft runs between the hook and the basal body, passing through protein rings in the cell's membranes that act as bearings. Gram-positive organisms have 2 basal body rings, one in the peptidoglycan layer and one in the plasma membrane. Gram-negative organisms have 4 rings: L ring associates with the lipopolysaccharides, P ring associates with peptidoglycan layer, M ring embedded in the plasma membrane, and the S ring directly attached to the plasma membrane. The filament ends with a capping protein. The bacterial flagellum is driven by a rotary engine composed of protein, located at the flagellum's anchor point on the inner cell membrane. The engine is powered by proton motive force, i.e., by the flow of protons (i.e., hydrogen ions) across the bacterial cell membrane due to a concentration gradient set up by the cell's metabolism. (In Vibrio species, the motor is a sodium ion pump, rather than a proton pump). The rotor transports protons across the membrane and is turned in the process. The rotor by itself can operate at 6,000 to 17,000 revolutions per minute (rpm), but with a filament attached usually only reaches 200 to 1000 rpm. The components of the flagellum are capable of self-assembly in which the component proteins associate spontaneously without the aid of enzymes or other factors. Both the basal body and the filament have a hollow core, through which the component proteins of the flagellum are able to move into their respective positions. The filament grows at its tip rather than at the base. The basal body has many traits in common with some types of secretory pores, which have a hollow rod-like "plug" in their centers extending out through the plasma membrane. It was thought that bacterial flagella may have evolved from such pores, though it is now considered that these pores are derived from flagella. Different species of bacteria have different numbers and arrangements of flagella. Monotrichous bacteria have a single flagellum (example:Vibrio cholerae). Lophotrichous bacteria have multiple flagella located at the same spot on the bacteria's surface, which act in concert to drive the bacteria in a single direction. Amphitrichous bacteria have a single flagellum each on two opposite ends. (Only one end's flagellum operates at a time, allowing the bacteria to reverse course rapidly by switching which flagellum is active.) Peritrichous bacteria have flagella projecting in all directions (example: Escherichia coli). Some species of bacteria (those of Spirochete body form) have a specialized type of flagellum called axial filament that is located in the periplasmic space, the rotation of which causes the entire bacterium to corkscrew through its usually viscous medium. Anticlockwise rotation of monotrichous polar flagella thrusts the cell forward with the flagellum trailing behind. Periodically, the direction of rotation is briefly reversed, causing what is known as a "tumble," and results in reorientation of the cell. The direction at the end of the tumble state is random. The length of the run state is extended when the bacteria moves through a favorable gradient. The archaeal flagellum is superficially similar to the bacterial (or eubacterial) flagellum; in the 1980s they were thought to be homologous on the basis of gross morphology and behavior (Cavalier-Smith 1987). Both flagella consist of filaments extending outside of the cell and rotate to propel the cell. Bacterial flagella are powered by a flow of H+ ions (or occasionally Na+ ions); archaeal flagella are almost certainly powered by ATP. The torque-generating motor that powers rotation of the archaeal flagellum has not been identified. While bacterial cells often have many flagellar filaments, each of which rotates independently, the archaeal flagellum is composed of a bundle of many filaments that rotate as a single assembly. Bacterial flagella are thicker than archaeal flagella, and the bacterial filament has a large enough hollow "tube" inside that the flagellin that subunits can flow up the inside of the filament and get added at the tip; the archaeal flagellum is too thin to allow this. These differences mean that the bacterial and archaeal flagella are a classic case of biological analogy, or convergent evolution, rather than homology (sharing common origin). However, in comparison to the decades of well-publicized study of bacterial flagella (e.g. by Berg), archaeal flagella have only recently begun to get serious scientific attention. Therefore, many assume erroneously that there is only one basic kind of prokaryotic flagellum, and that archaeal flagella are homologous to it. The eukaryotic flagellum is completely different from the prokaryote flagella in structure and assumedly historical origin. The only shared characteristics among bacterial, archaeal, and eukaryotic flagella is their superficial appearance; they are intracellular extensions used in creating movement. Along with cilia, eukaryote flagella make up a group of organelles known as undulipodia. A eukaryotic flagellum is a bundle of nine fused pairs of microtubule doublets surrounding two central single microtubules. The so-called 9+2 structure is characteristic of the core of the eukaryotic flagellum called an axoneme. At the base of a eukaryotic flagellum is a basal body, "blepharoplast" or kinetosome, which is the microtubule organizing center for flagellar microtubules and is about 500 nanometers long. Basal bodies are structurally identical to centrioles. The flagellum is encased within the cell's plasma membrane, so that the interior of the flagellum is accessible to the cell's cytoplasm. Each of the outer 9 doublet microtubules extends a pair of dynein arms (an "inner" and an "outer" arm) to the adjacent microtubule; these dynein arms are responsible for flagellar beating, as the force produced by the arms causes the microtubule doublets to slide against each other and the flagellum as a whole to bend. These dynein arms produce force through ATP hydrolysis. The flagellar axoneme also contains radial spokes, polypeptide complexes extending from each of the outer 9 mictrotubule doublets towards the central pair, with the "head" of the spoke facing inwards. The radial spoke is thought to be involved in the regulation of flagellar motion, although its exact function and method of action are not yet understood. Motile flagella serve for the propulsion of single cells (e.g. swimming of protozoa and spermatozoa) and the transport of fluids (e.g. transport of mucus by stationary flagellated cells in the trachea). Additionally, immotile flagella are vital organelles in sensation and signal transduction across a wide variety of cell types (e.g. eye: rod photoreceptor cells, nose: olfactory receptor neurons, ear: kinocilium in cochlea). Intraflagellar transport (IFT), the process by which axonemal subunits, transmembrane receptors, and other proteins are moved up and down the length of the flagellum, is essential for proper functioning of the flagellum, in both motility and signal transduction. In Chelicerata (an arthropod subphylum that includes spiders, scorpions, horseshow crabs, sea spiders, and so forth), the flagellum is a non-segmental, pluri-articulated whip, present in the arachnid orders Schizomida, Thelyphonida, and Palpigradi. In Schizomida, the flagellum of the male has complex morphology and is widely used in taxonomy. Miller, K. R. 2004. The flagellum unspun: The collapse of "irreducible complexity". Ken Miller's Home Page. Retrieved February 19, 2007. Patterson, D. J. 2000. Flagellates: Heterotrophic protists with flagella. Tree of Life Web Project . Retrieved February 17, 2007.